This is a thick crusted pizza that has a whole wheat crust, and has healthy toppings for those who love pizza, but want to maintain a healthy diet. Preheat your oven to 425 degrees F. Heat the oil in a pan and sauté the spinach with the garlic and a spoonful or two of water until wilted. Prepare your pizza dough, and after the first rising by rolling it into a 12 inch circle and laying it across a pizza pan prepared by lightly oiling or sprinkling with cornmeal. 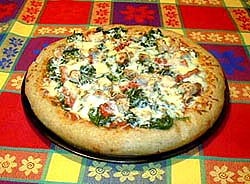 Spoon the sauce over the crust and add the other toppings, starting with the spinach and finishing with the cheese. Bake for 25-30 minutes or until puffy and golden.